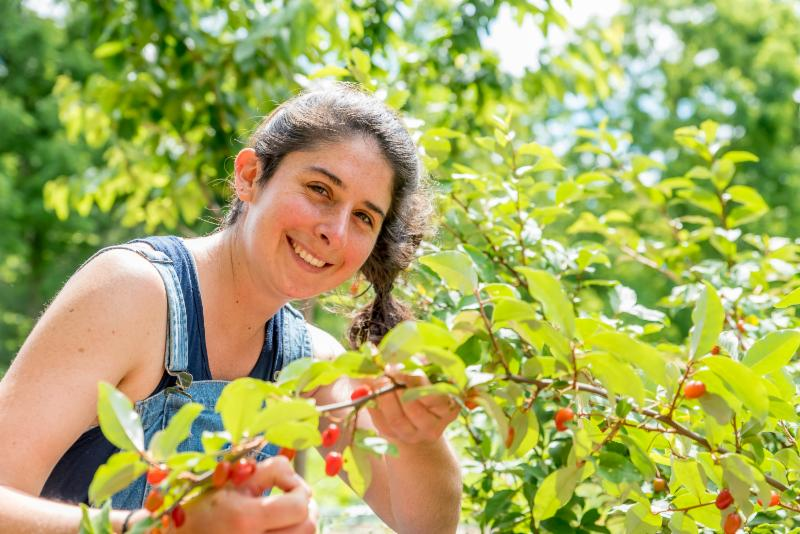 About a week or two after petals from your apple blossoms fall, you should start checking your upper leaf surfaces for little purple spots, which is an early indicator of black rot. Eventually, the middle of these purple spots will turn yellow or brown in color, as well as dry out, while the margins of the spot will remain purple. The shape of the spot may become irregular and the middle of the spot also might form pycnidia, which are small, black pimple-like fruiting bodies of the fungus. A heavily affected leaf will usually drop off. Tree branches or limbs might contain cankers, or sunken in areas of bark that are reddish brown in color. When sap continues to ooze from a pruning cut, one of the causes may be black rot gaining a foothold in the wood. These areas can expand each year and cause the affected limb to die. At any sign of rot or canker on the wood, a biological mudpack is a great way to combat organically, prior to the drastic measure of pruning a badly infected limb. Black rot is found on your fruit in usually only one spot, which can differentiate black rot from bitter rot. The original spot on your fruit can be from any break of the skin of the fruit, including insect injuries. 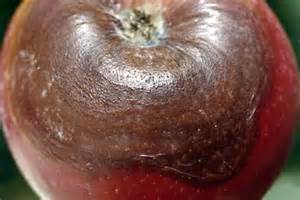 Starting as a brown spot, the rot will most likely grow and possibly turn black. You might also see more pycnidia on the fruit during this time. The fruit can form concentric rings around the spot and the fruit will begin to turn leathery. As the fruit decays, dries and shrivels up, it will eventually become completely mummified. Treatment of black rot is a year round process, that begins with building healthy soil and good tree maintenance during the winter.Black rot can overwinter, which means that it will lay dormant in your tree, bark, limbs, cankers and mummified fruit and survive until the next fruiting season. You should always clear or prune dead or decaying wood, as well as fallen debris or dead fruit from around your tree. The best way to rid your trees of black rot is to cut out the offending areas or cankers during the winter. Make sure to dispose of these properly, either by disposing in trash bags, burning, or burying them. It is also important to take away all mummified fruit, for the same reason of limiting the spread of fungal spores. 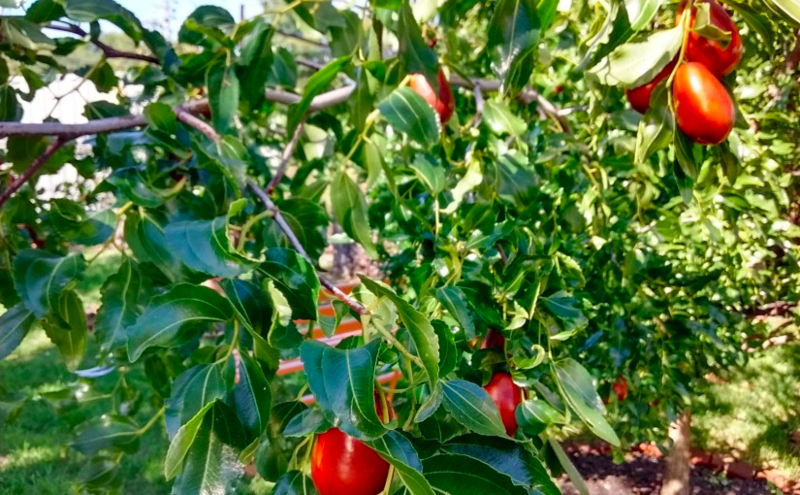 Additionally, when your tree is fruiting, you should remove fruit that is damaged or invaded by insects, so that the fungus will not spread there. While you could try organically-approved fungicides, such as copper-based sprays or lime sulphur, these are still quite harsh and should be considered a last resort. The best method is to keep a sanitary tree environment all year round and consistently remove all sources of fungus spores. This edition of POP Tips compiled by Education Intern, Rachel Baltuch. Cedar Apple Rust (CAR) is a fungal disease that attacks apples. It mainly occurs in North America in areas east of the Rocky Mountains. This fungus requires two hosts to complete its life cycle: the apple (Malus) and the Eastern Red Cedar (Juniperus). Only spores produced on cedar can infect the apple. 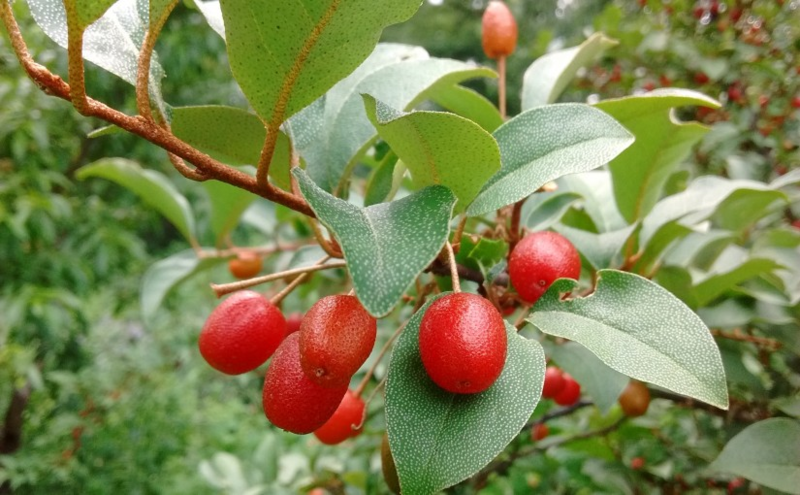 Similar cedar rusts can also affect pears, hawthorns, quinces, and serviceberries/juneberries. Cedar apple rust on fruit with characteristic orange spore bodies. 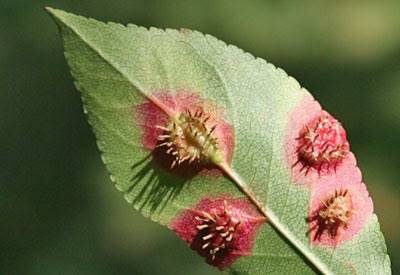 Similar cedar rusts also infect serviceberries, hawthornes, quinces, and even pears! Once CAR has overwintered in galls on cedar trees, spring rains can cause horn-like structures to protrude from the galls. These structures, called telia, can then become jelly-like and swollen. When the telial horns absorb water, tiny spores inside the structure germinate and are discharged in the air, which is how CAR reproduces. 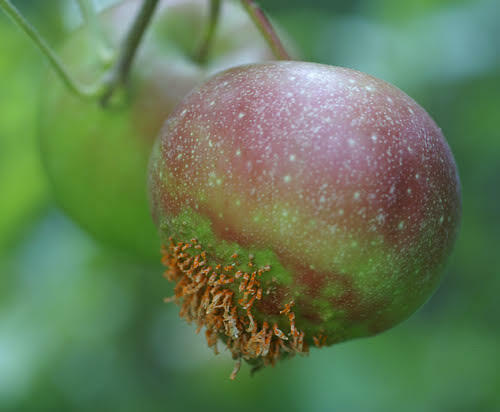 Any spores that land on young apple tissue may germinate and infect the tree if enough water is present and the temperature is between 46 to 75 degrees Fahrenheit. Humid spring conditions are ideal for infection. Once an apple tree is infected with the rust, small yellow spots will appear on the leaves and fruit. These will later expand and turn orange, with brown hairy gall structures appearing on the underside. Infected fruit will be small, malformed, and may drop before reaching maturity. Cedar apple rust on the underside of leaves. 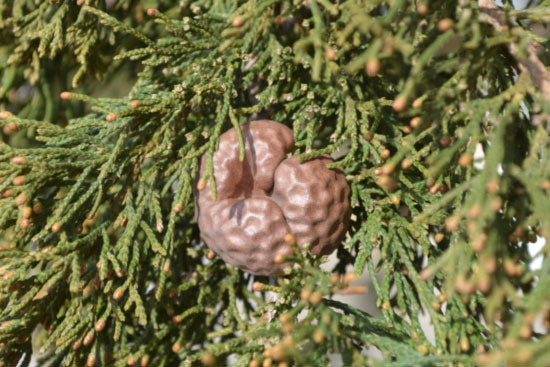 Cedar Apple Rust spores can travel up to 4 miles, so your trees may be at risk of infection even if there isn’t an Eastern Red Cedar or Juniper on your property. Removing nearby trees of this type is still a good way to reduce the chance of infection. There are also several apple cultivars that are resistant to CAR and can be planted when available in order to reduce instances of this fungus. Another easy way to reduce infection is to rake up and dispose of fallen leaves and fruits from under the tree in the fall and remove galls from nearby cedars. If CAR is a big problem for your orchard, preemptive organic fungicide sprays of copper or sulfur in mid-spring after the spores have been released from the cedar host may reduce infection. Neem oil may also help to a lesser degree. This spray should be done around the time of tight cluster in apples (when leaves and buds are present, but before the blossoms open up). Spores are only released once in spring, so spraying during the growing season is not effective. Cedars (junipers) are the alternate host for the disease. Removing the brown overwintering galls from nearby cedars can help reduce infection of apple trees, but spores can travel miles! This edition of POP Tips prepared with assistance from POP Intern Nettie Baugher. 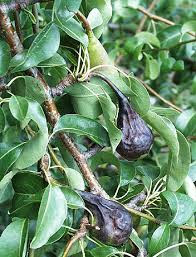 Fire blight is a bacterial disease mostly affecting apples, pears, Asian pears, and close relatives like quinces and hawthorns. It gets its name because it causes young fruits, shoots, and branch tips to appear blackened and shriveled, as though scorched by fire. Dead leaves remain on the tree and shoot tips curl downward. 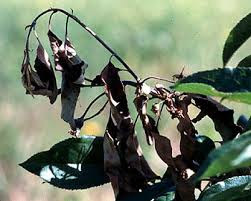 Fire blight is mostly contracted through spring blossoms of fruit trees. Honeybees can be a carrier of the disease after they’ve pollinated an infected blossom. Once a tree is infected, it carries the disease indefinitely unless removed through pruning. 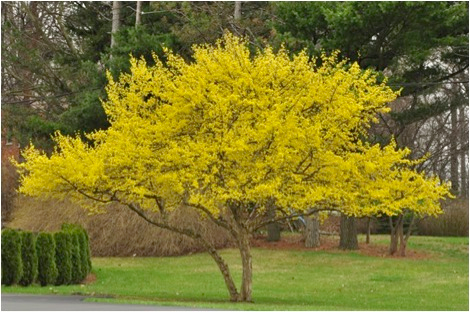 An infection can be spread from the blossoms and branch tips to the rest of the tree and appears as a black discoloration in the bark. Weather conditions greatly affect the rate of the disease spread. The disease is most seriously spread during wet springs, especially if it is warm and rainy during bloom-time or pre-boom. An otherwise healthy tree showing signs of Fire Blight can be cared for an managed through pruning of damaged areas. Prune off diseased wood as soon as you notice it to prevent it from spreading. Pruning cuts should be made into healthy wood, at least 6 to 12 inches below where you see any sign of infection. It is very important to sterilize your tools between each pruning cut (good general practice anytime you’re pruning during active growing season) to avoid spreading the disease. Use rubbing alcohol or a 10% bleach 90% water solution to sterilize. This can be done by dunking your pruner or saw blade or by using a spray bottle to coat the blade in between each cut. 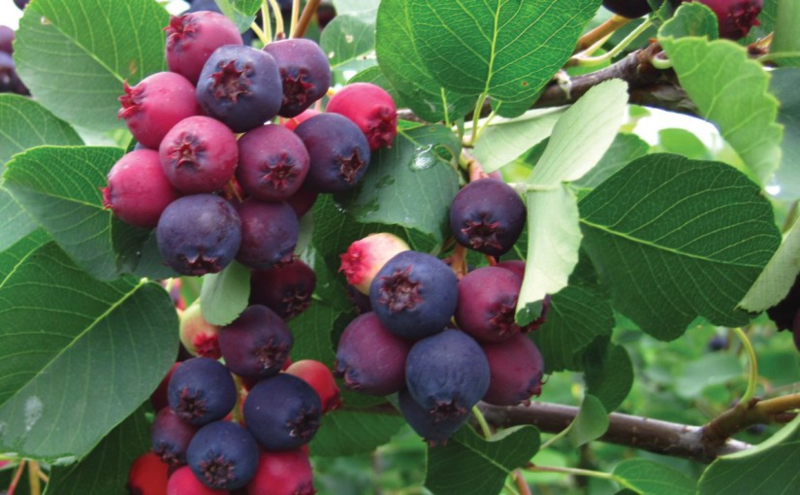 Prevention of Fire Blight starts with selecting disease resistant varieties of your trees (see link below). A copper sulfate spray in early spring before infection also can reduce your chances of contracting the disease. Unfortunately, there is no ultimate cure for Fire Blight, and the best way to avoid it is to carefully monitor your trees for early signs and take preventative measures. This edition of POP TIPS prepared with assistance from 2014 POP intern Megan Bazin.